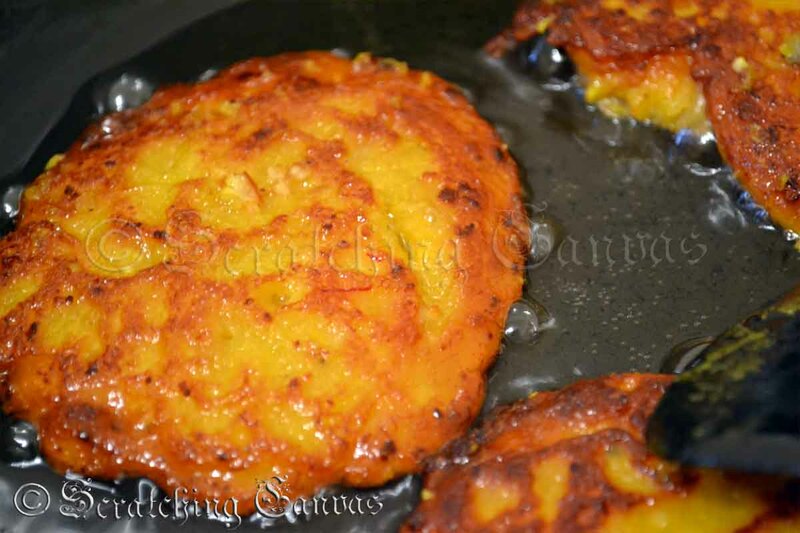 Again it was a Friday or ‘Fry-Day’ for me and as always I was looking for a fresh fried recipe for my family. The saddest part was my pantry was almost empty just like my head (LOL) and I was unable to go outside due to my sickness. 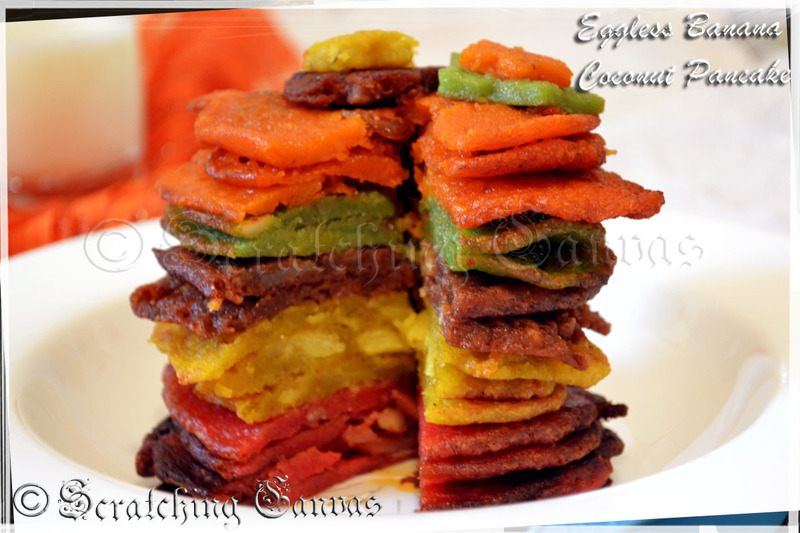 So I had no option left other than surfing net for some new recipe with simple ingredients.. 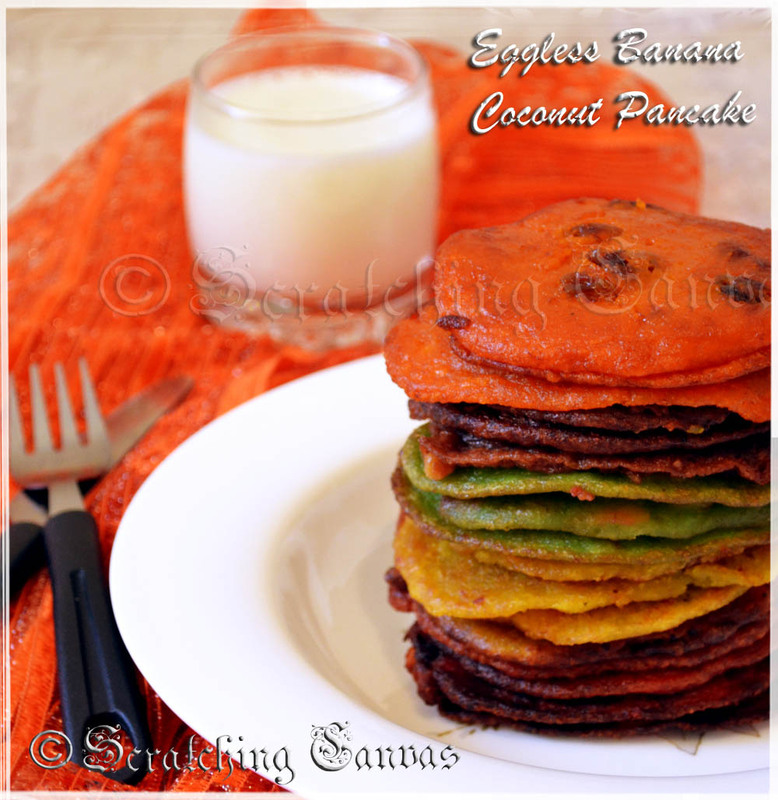 This egg less banana coconut pancake is a thin flat bread cooked on a pan with smashed banana and coconut flakes in it. 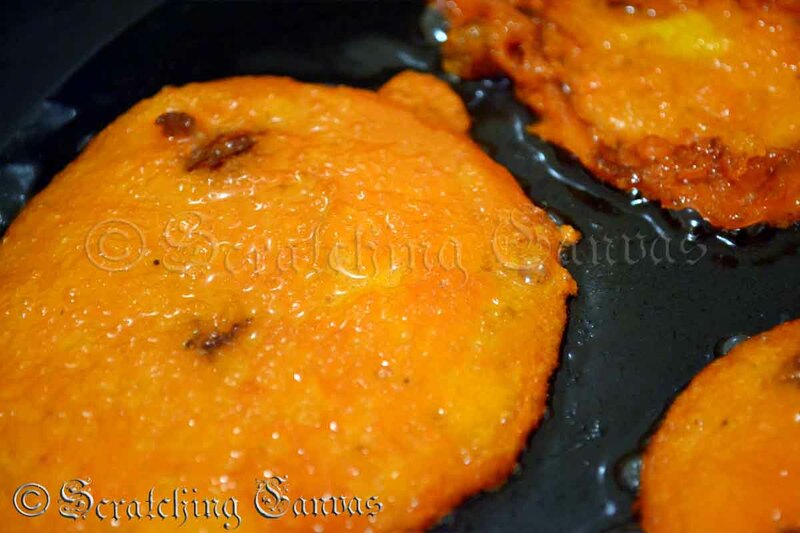 This is a classic dessert for the fried dessert lovers. 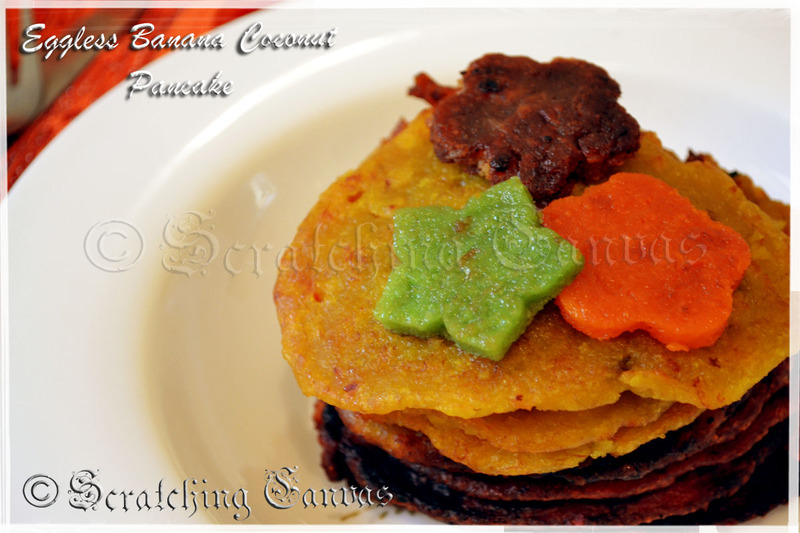 I used five different dry fruits and flavors to make these pancakes unique and sinful. 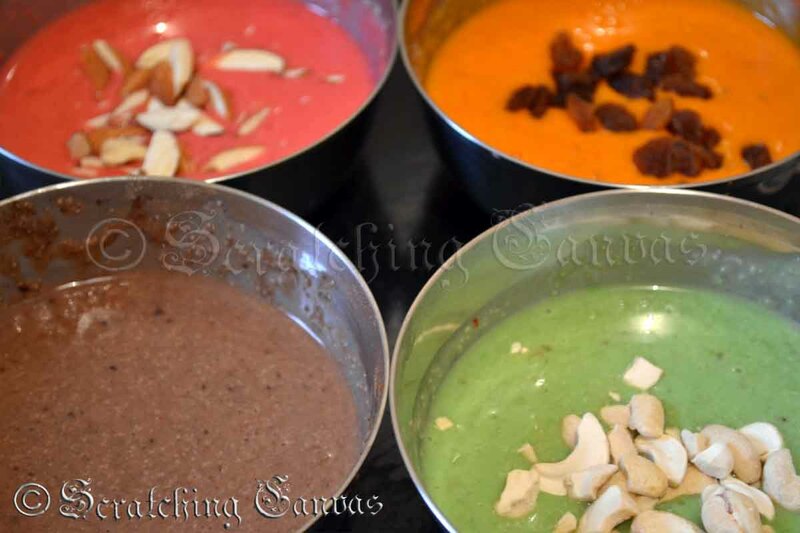 Pancakes of each flavor had a unique color ranging from pink, orange, yellow, green and brown.. So I like to lovingly call them as rainbow pancakes. 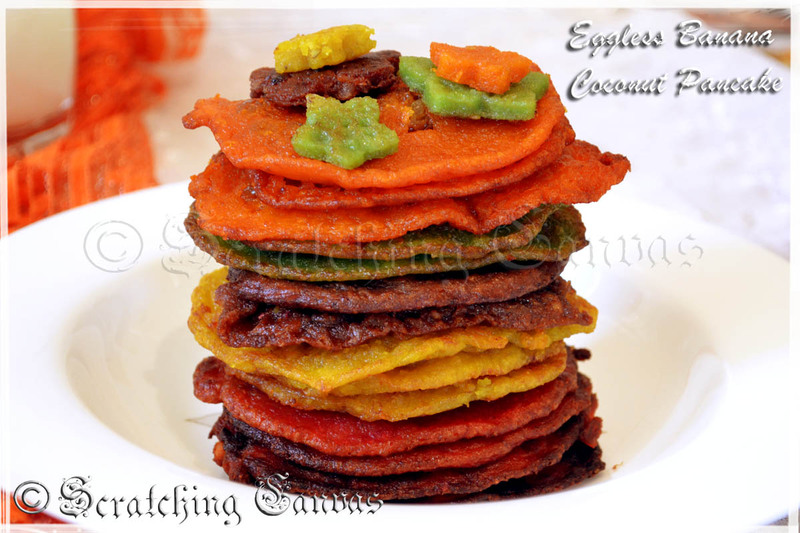 So today my pick is recipe of Eggless Banana Coconut Sweet pancake with different dry fruits and flavors. 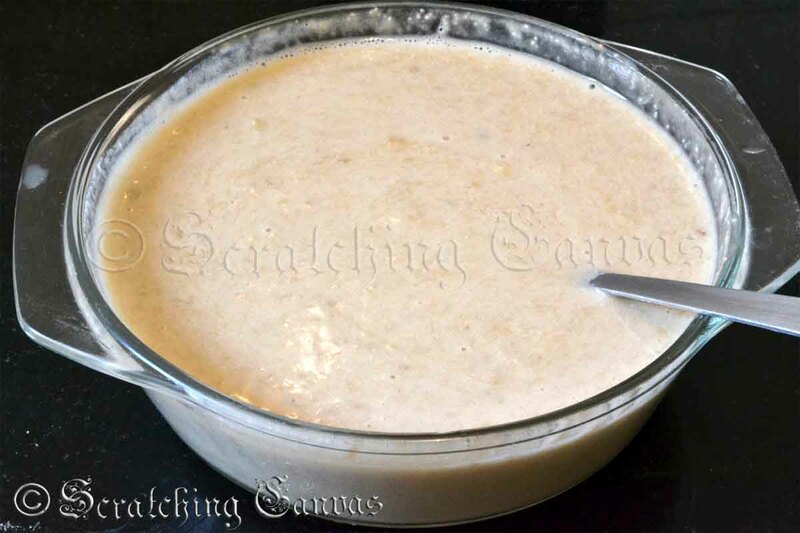 Sieve and shift flour, baking powder and salt in a large bowl. Smash the bananas in a separate larger bowl. 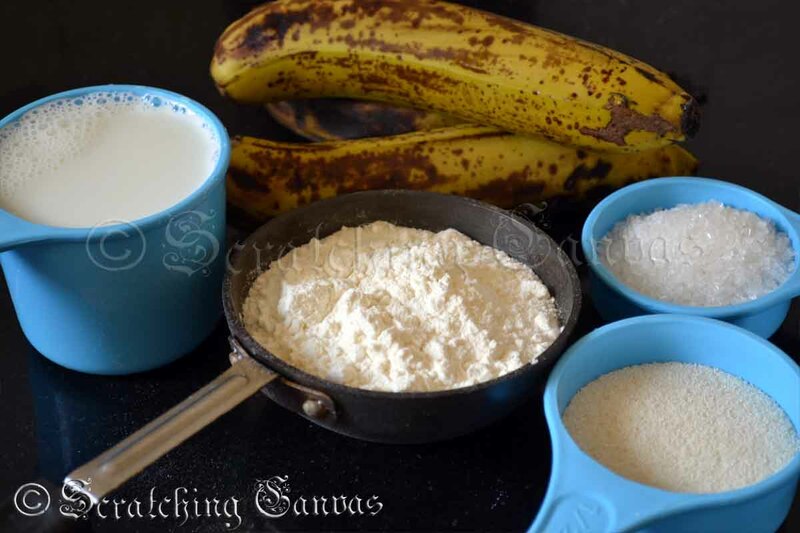 Add flour and baking powder mixture into the smashed banana little by little at a time to avoid lumps. 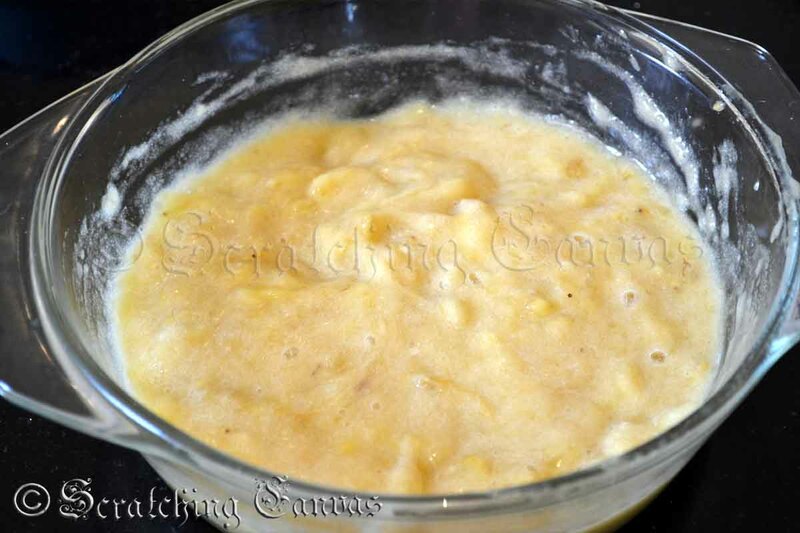 Mix very well so that no lumps are formed. If any lumps get formed smash it and mix well. 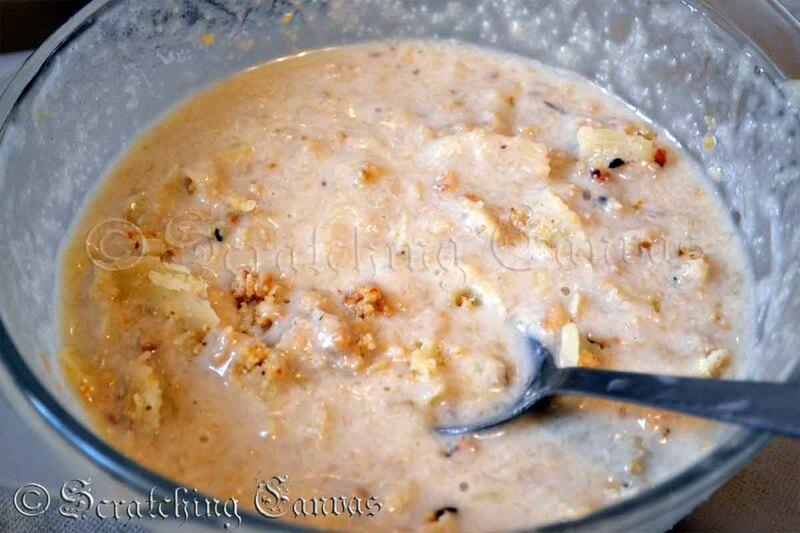 Add semolina and keep mixing. Add granulated sugar and keep beating. 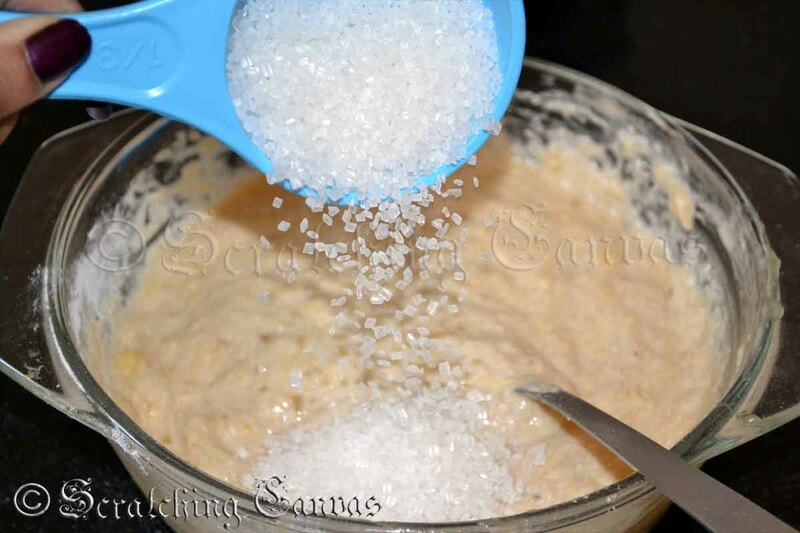 Once sugar starts to dissolve add milk little by little from one hand and keep mixing with oither hand. 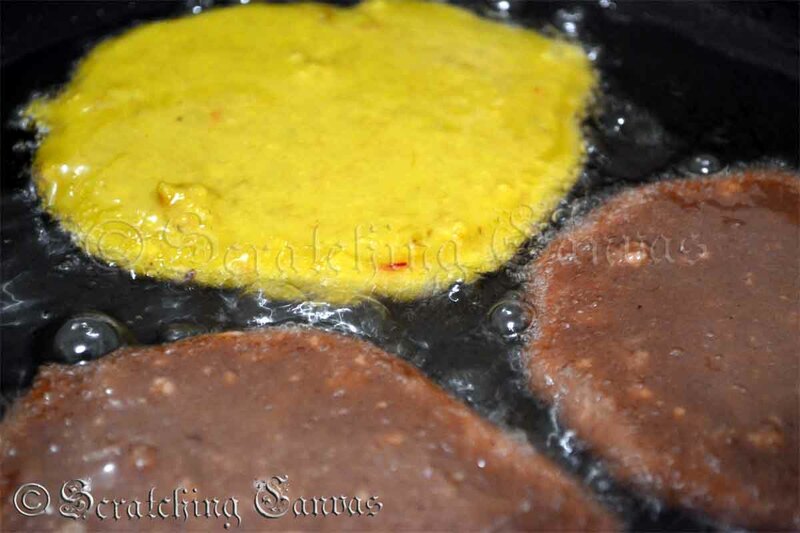 Make a smooth lump free thick batter. The consistency of the batter should be neither tight nor runny. It should be able to coat the back of a spoon. 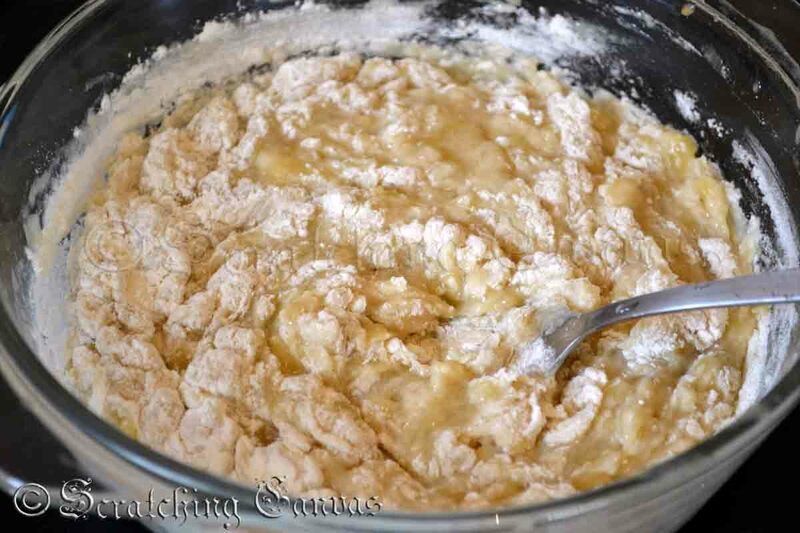 Divide the batter into five equal portions. Keep in separate five bowls. Pour coconut flakes in a portion. 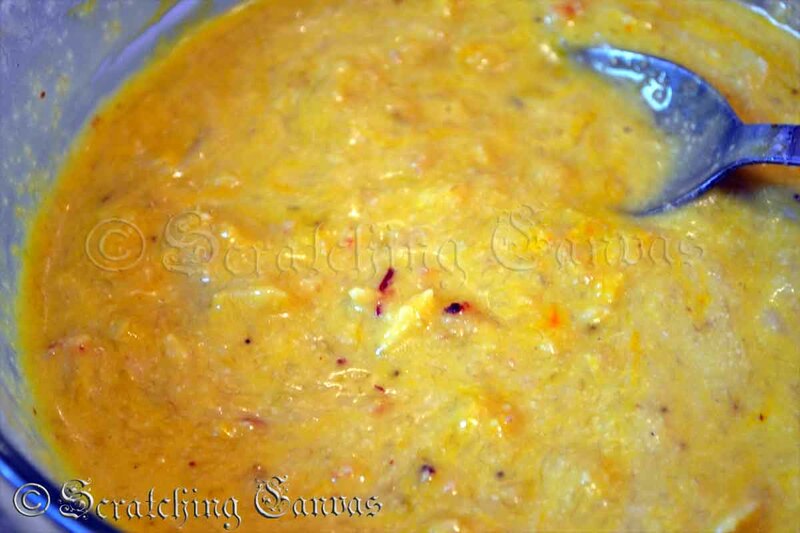 Mix saffron soaked milk in that potion and mix well. 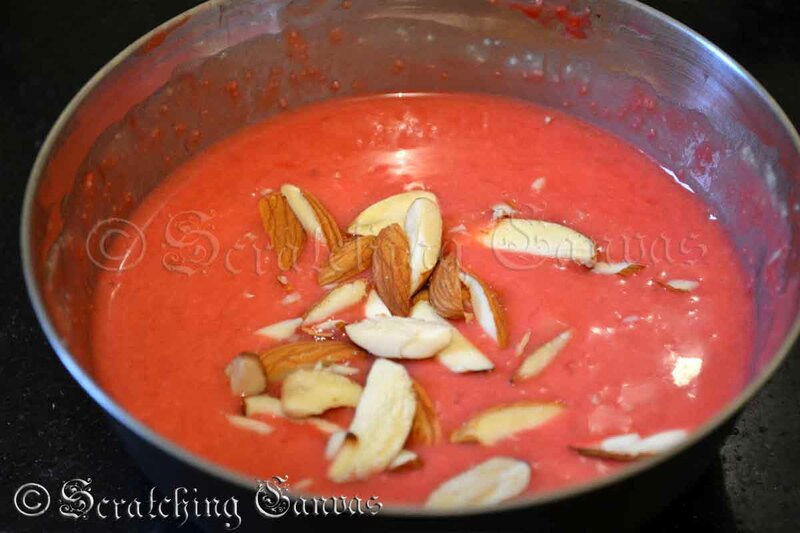 Take another portion and mix rose essence, pink color and almond slivers with it. 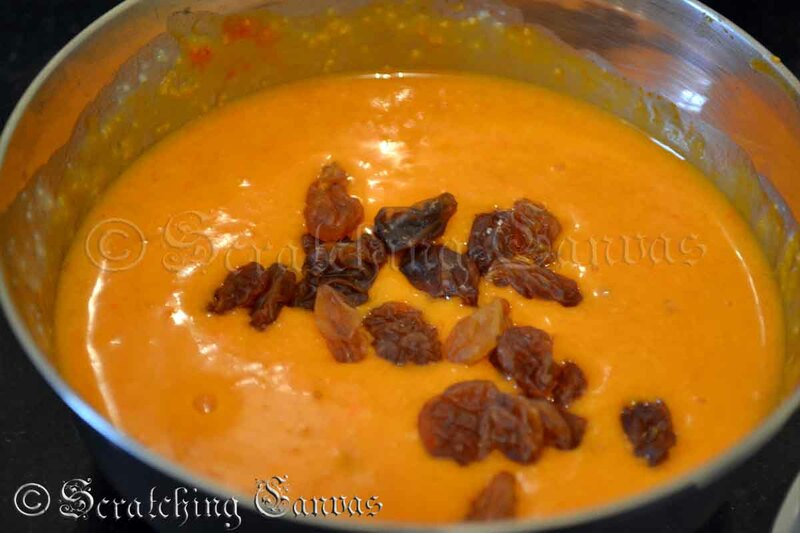 Take third portion and mix orange color, essence and raisin in it. 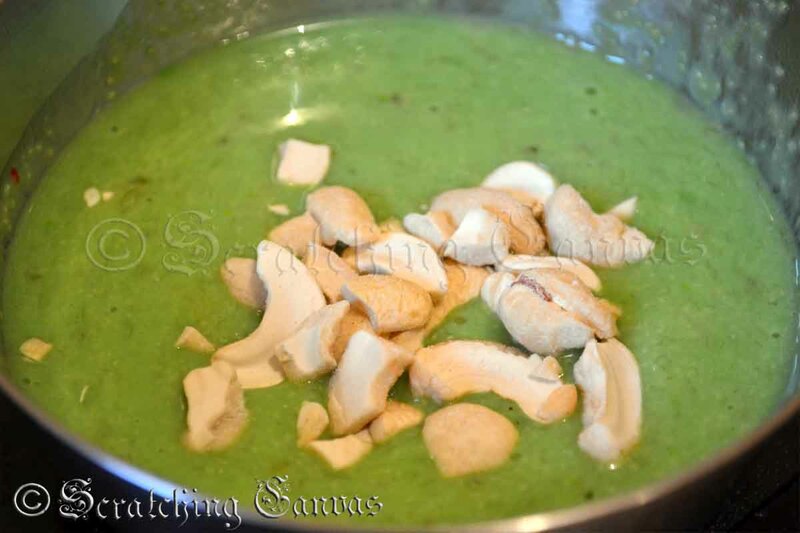 Mix pistachio color, essence and chopped cashew nuts with the forth portion of the batter. 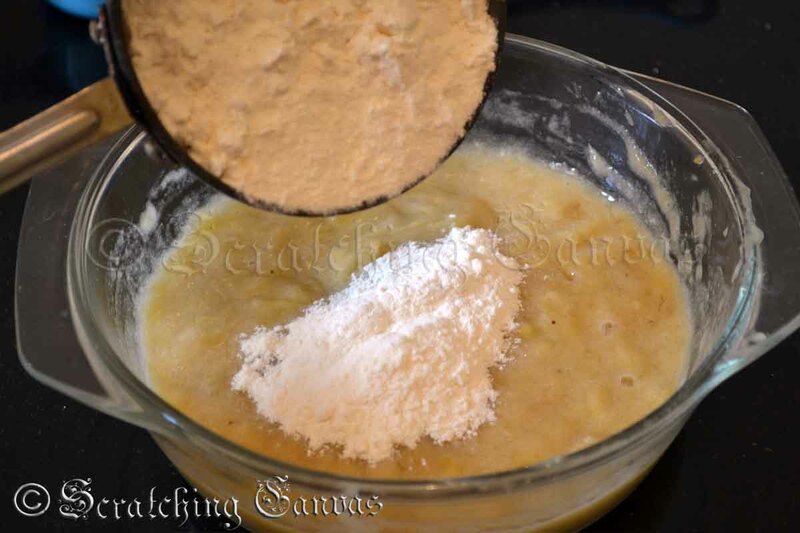 Mix coco powder to the fifth and final portion of the batter. Heat oil in a large non-stick pan. 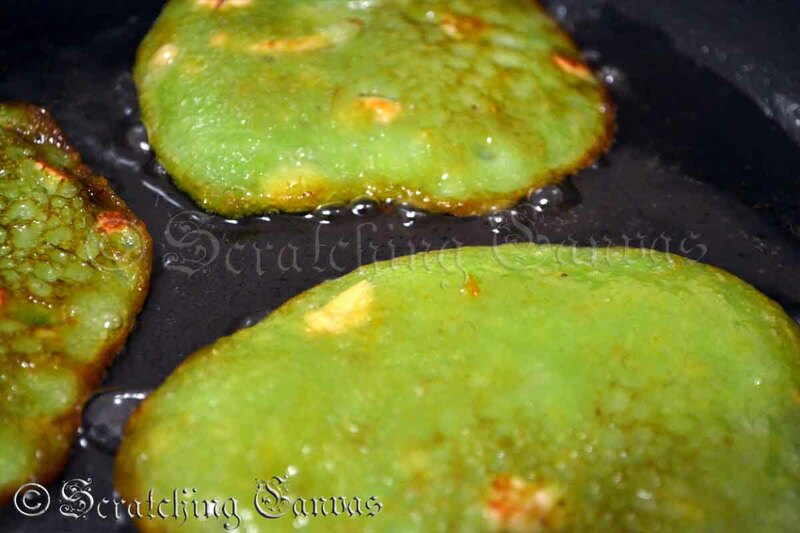 take a spoonful of the each flavored batter and pour in the hot oil. Fry each pancake on both sides till they are done. Be careful not to burn the pancakes. Make sure each cake is perfectly cooked. 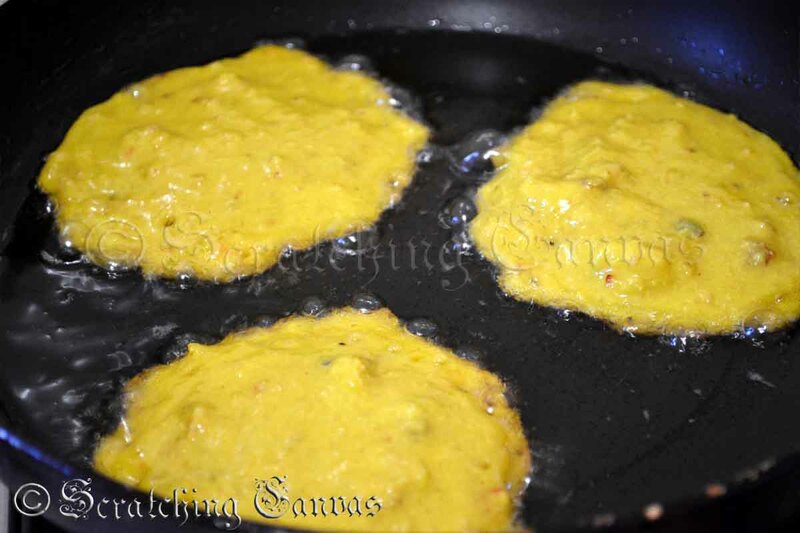 Add oil at the edges of the pancakes if necessary. 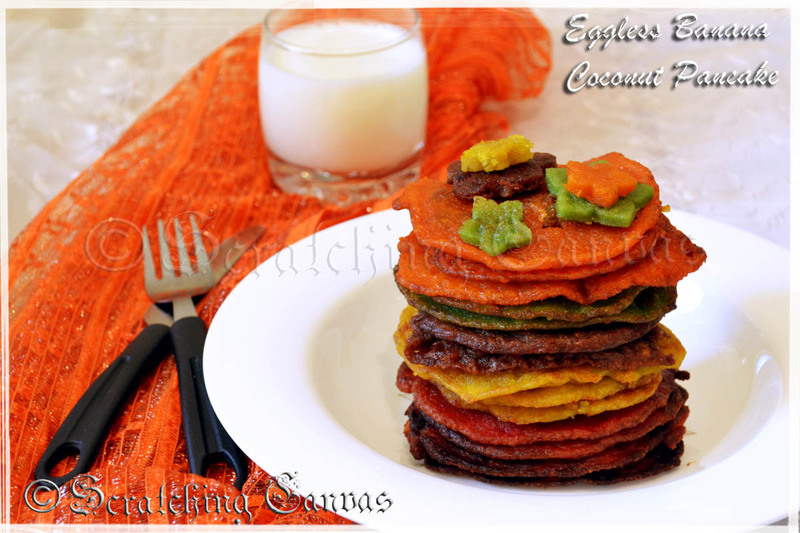 Eggless banana coconut pancakes are done. Serve warm on breakfast with maple syrup. 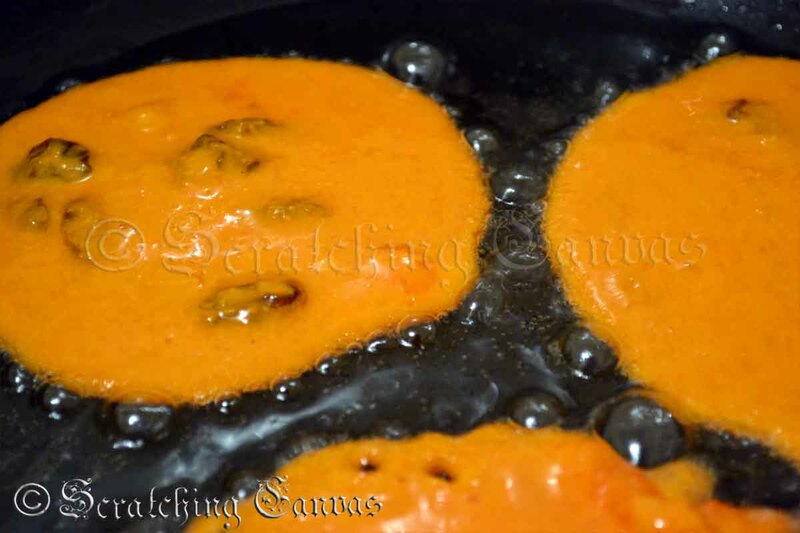 These pancakes can be a delightful dessert too. Make sugar syrup with 1:1 water and sugar and keep boiling until it reaches one string consistency. Soak the pancakes in the hot sugar syrup and serve immediately.